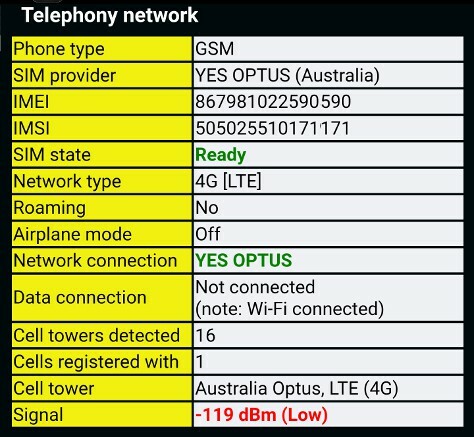 This phone test is for the cellular network, Wi-Fi, Bluetooth and NFC (where supported). If you inserted a SIM (recommended) then you should check the SIM state is ready (showing the phone’s SIM holder is OK) and the phone is connected to a network (showing basic telephony functions are working). If you are buying a used phone, you should note the IMEI number or MEID/ESN and use it to check whether the phone is blocked in your country. This is normally an indication that the phone was lost or stolen. Note: if Wi-Fi is connected, the Phone Network Data connection would normally show as disconnected (this is normal). If you connected the phone to a Wi-Fi network (recommended), you should check the SSID is shown and the Link speed is reasonable for your network type (e.g. 802.11n or ac) and phone/tablet is shown. 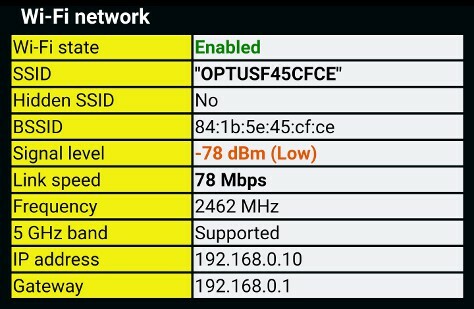 This shows the basic Wi-Fi connection functionality is working. The Bluetooth section displays information about whether Bluetooth is supported and has been enabled successfully. The NFC section displays information about whether NFC is supported and has been enabled successfully. E.g. for use with Android Pay or Samsung Pay. The IR section shows whether IR (e.g. TV remote control) is supported. A series of short network checks and connectivity tests are performed to check the network and connectivity function. The network tests check the telephony network connection, the WiFi connection, the IP address of the device, the IP address of the local gateway and performs a ping test to the network gateway. If Bluetooth is supported, the test will check that Bluetooth has enabled successfully and has paired with other Bluetooth devices. If the in-app purchase has been made, it will also perform a Bluetooth test scan for nearby Bluetooth devices. If NFC is supported, you should place an NFC tag behind your phone and listen for the registration beep. Please ensure the notification volume is turned up so you can hear the beep. If the in-app purchase has been made, it will also perform an integrated NFC test and indicate if the card or tag was successfully detected OK. Many NFC tags or credit cards with a contactless symbol will work. If the telephony network, Wi-Fi network, Network tests, Bluetooth and NFC tests are OK, select OK.